Building the right team is one of the key requirements for any administration to be successful; while great and visionary leaders can point the way, only great leadership teams can achieve success. Trust occurs at a truly biological level. Trust, or the lack of it, has allowed humans to survive. Trust is what fosters the building of families, communities and nations; what allows us to engage in commerce, in friendship and in relationships, big or small. Will they be there when I need them? Will my family, my community, my country care for me when I am old, sick or weak? Will my agreement be honored? These and many other questions are answered through trust. Trust gives us the ability to predict a positive, supportive outcome in a world where our very nature is designed to ward off threats and dangers. Uncertainty, of which untrustworthiness is a principle feature, diminishes our ability to progress, to grow and perhaps even to survive. Trust is critical when building a high-functioning team -- witness the many team-building exercises recommended by leadership development gurus, most aimed at answering the question, "Can I count on you to be there for me?" Much has been said about how trust is gained or lost, so I will focus on the trust factor when building a new leadership team, when personal experience with members of the team is limited at best. So, what exactly do we mean when we speak of trustworthiness in building a team? 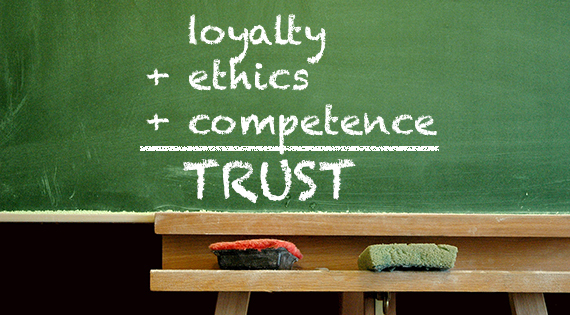 How do we know whether a team member is, and more importantly will be, trustworthy? My perspective, having built a number of what I consider to be high-functioning teams over the past 20 years, is that it's centered around trust in three areas. Trust of my integrity -- This is the area that most of us call '"trust." We also can call it "allegiance," "loyalty" or "fidelity." Will this person be there for ME? Can I trust him/her with my confidence? Do I believe this person has my best interests at heart? In short, can I trust this person to keep me safe ALWAYS? Undoubtedly this is an important factor to consider, particularly in the risky environment of leadership (perhaps even more in academic administration). But this facet is primarily about me, the individual. Essential for one's own survival, but not enough to address the greater mission that most high-functioning teams must address. This type of trust must be demanded clearly and unequivocally from the start... and yet can only be assessed retroactively with experience. It is the most critical for leadership and team survival yet the most fragile to ensure. But if we make our decision about trustworthiness based solely on this aspect of trust, we will end up with a team loyal to ourselves, but not necessarily serving the best interests of the institution and who may not even be competent to do their jobs (which in turn, and ironically, will place any leader in significant danger). Trust of ethics -- This is an area often glanced over when assessing it, primarily because most of us assume that the ethics and morals of individuals who have risen ("risen" being a relative word) to the level of consideration is already high. However, ethical trust isn't just about whether the team member doesn't have a criminal record; it's about whether their moral compass is functioning properly. Do they naturally understand the greater good? Are they innately and scrupulously honest in all their dealings, whether with team members or their own families and associates? In other words, as a team member, can I trust them to ALWAYS aim to do the right thing? This is where speaking to others who have had dealings with the potential team member, or assessing thought experiments and the narrative of past experiences with the candidate, can be helpful to better understand how the potential team member responds to ethical or moral quandaries. Trust of competence -- The final aspect of trust is one that I believe too often is not considered sufficiently as part of the trust equation. While trust of ethics is about "doing the right thing," trust of competence is about "doing things right ALWAYS." Because regardless of whether an individual has your best interests at heart and aims to do the right thing, they will fail you and all (and hence prove untrustworthy) if they do not have the skills necessary to actually accomplish the task ahead. We should note that trust of competence is not solely being able to accomplish the job at hand, but also being insightful about one's own limitations and, perhaps even more importantly, knowledgeable about when to call for help. The most dangerous individuals I have encountered are not those who attempted to push me under the bus (and there have been a few of those!) or those who have been dishonest (and I have seen those as well), but individuals who simply do not understand their own limitations. Here again, speaking to others who have worked with the potential new team member, or having the candidate discuss possible scenarios and past experiences, may be very helpful. So, the Trust Equation: the summation of the three key facets of trust -- trust of my integrity plus trust of ethics plus trust of competence. In addition, there are two essential characteristics of trust and trustworthiness that should be recognized. Trustworthiness is about unwavering consistency. Trustworthiness is not about "sometimes" or even "often" or "almost always." It's about ALWAYS. Because unless we can count on that trust always and at any time, it is not trust at all. Trust is a two-way street. Human nature being what it is, trust will persist only if it is reciprocated. Why? For lots of reasons, not the least being that we also want to be trustworthy; we, ourselves, want to be worthy of such recognition. And when an individual does not trust us, particularly once we have offered him or her our trust, then we feel undervalued and underappreciated -- in direct contradiction to the first aspect of trust, trust of personal integrity. So for trust to be persistent between individuals or within a team, it must be consistent and reciprocated. Lastly, a question I am often asked is, "How do we initiate trust when building a team?" Do we start with a zero balance and build up over time, dictated by our developing experience? Or do we start with a full tank of trust and spend it down? Or somewhere in between? Unfortunately, human history has proven time and time again that in hostile or unknown environments, survival calls for the first approach: All is untrustworthy until proven otherwise. But this mechanism of building trust is lengthy and easily hampered, since any negative events reverse gains. It has resulted, even millennia later, in persistent distrust between many nations and even more peoples. Obviously, such an approach to building trust is not suitable for the timely development of a high-performing team! Alternatively, the granting of full and unambiguous trust without prior condition or experience should occur only in settings of maximum safety. Examples include trust between parents and their children, within families and between spouses and partners. It can be extremely risky to award full and unguarded trust a priori in less secure settings, likely including when building your team. So I believe that most of us start our team building by granting members a moderate to significant amount of trust (depending on our comfort level) from the moment the individual becomes part of the team. As the author Ernest Hemingway reminds us, "The best way to find out if you can trust somebody is to trust them." Then we increase or decrease that trust based on our continuing experiences with that individual. In summary, the issue of building and giving trust is at the crux of effective team building. As we evaluate the trustworthiness of potential team members, it is critical that we do so in three facets: Trust of your integrity, and trust of their ethics and competency. What we can call The Trust Equation. A trust that should be consistent and reciprocal. And a trust that is generally granted to some degree a priori, to grow (hopefully) or diminish with time and experience.